New official Murder Mystery Party download! Previously sold as the boxed game of the same name and now out of print, you can download and play these classic high street games immediately. Full instructions included in download. You will need a printer to print this game, no box is shipped. You will receive an email after purchase with download instructions. Glynn Eagles, owner of the prestigious Callow Way Golf Club, has just announced plans to build a new exclusive golf resort and is hosting a party to celebrate. However, during a round of golf before the party begins, Glynn is clubbed to death on the green of the 18th hole. Host your own party to find out who ended his round! Invitations to be sent to your guests. Complete instructions on how to host the party. Character profiles for all eight suspects. Costume suggestions. Menu suggestions. Clues. Solution to the murder. Note that the optional DVD and CD content is not included in the download but they are not required to play the game. 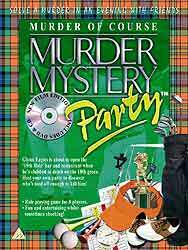 A MURDER MYSTERY PARTY GAME FROM BV LEISURE. DOWNLOAD GAMES ARE DIGITAL FILES ONLY AND ARE NOT BOXED GAMES!! WE CANNOT ISSUE A REFUND FOR DOWNLOAD GAMES SO PLEASE CONTACT THE STORE IF YOU ARE UNSURE ABOUT WHAT YOU ARE BUYING!! This purchase gives you a license to access the downloadformurder.com website for 30 days. You can email invitations to guests, download extras and of course download and print the game materials for this game. The license entitles to you make as many copies of downloadable materials as you wish for personal use but business use is excluded. You may not replicate or sell, in part or in whole, any downloaded content from this website without express written permission from the copyright holders.